Cu Yokes consist of mixed copper yokes, free of large attachments. 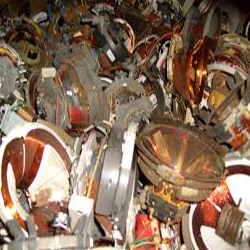 Copper yokes are mainly found in televisions and monitors. They have scrap metal value due to their copper wires. Average copper recovery is 35%-40%. Cu Yokes can be sold as-is at your local scrap yard or dealer, but can also be worthwhile to separate the copper windings from the yokes and increase the value of the material by selling them as #2 copper. The copper is usually coated and cannot be sold as bare bright copper. Cu Yokes are considered to be valuable scrap materials due to their copper content and can be sold to scrap yards and dealers at high prices, usually by the pound.